Everybody loves puppies! With their playful ways and cute appearance you can’t help but want to wrap them in cotton wool with many of the maternal feelings we have for our own children. However in all too short a length of time they grow to become adult dogs and it is our duty to give them as good a start as we can. In addition to puppy classes the Tellington TTouch can be extremely helpful in raising a well adjusted adult dog. The Tellington TTouch is a unique and rewarding way of working with all animals. Developed over 30 years ago by Linda Tellington Jones, TTouch offers ways to help animals overcome a wide variety of behavioural problems without the use of dominance, fear or force. Using a combination of bodywork and ground exercises the TTouch aims to improve the physical balance of the animal, as physical balance is achieved so mental and emotion balance follows. The behaviour of an animal can be linked to its posture in many ways, animals with tension through the hindquarters can often be afraid of loud noises such as fireworks, they may be reluctant to being picked up and placed on a veterinarians table and may be badly behaved in the car. With the use of TTouch these patterns of tension can be removed along with the unwanted behaviour. brushing produced no change, only the circular TTouched produced this amazing change in the animal’s brain waves. It has been proven that puppies raised in a stimulating environment have an increased ability to cope with stress in later life, so if we are able to stimulate our puppy’s brains with TTouch then the potential to increase their ability to learn is enormous! Just like children, puppies have little idea of what the world expects of them and how to behave, ‘bad’ puppies are often showing signs of worry or anxiety or possibly reacting to pain or discomfort in their own bodies. These behaviours are reactive and instinctive; nature governs how each animal will respond to the situation. Some puppies will roll over in a submissive type gesture others will run away while others will mouth or bite. By using TTouch it is possible to bring animals into a state of awareness whereby the animal is brought into a thinking state rather than the instinctive reactive mode normally seen. This ‘thinking’ state does away with the need for the harsh, negative behaviour modification methods we are all trying to move away from. bodywork we can give the body feedback as to what is where allowing the animal to achieve a much more balanced posture and mind from day one. 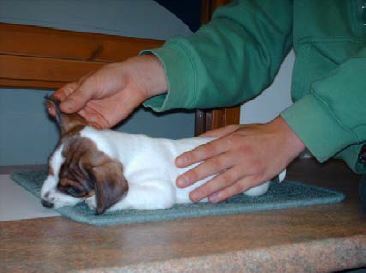 Photo 1: Take the ear in the direction it grows (Upwards for pointy eared dogs or horizontal for floppy eared dogs) and gently stroking from base to tip with each stroke covering a different part of the ear. This can quickly help to calm an excitable or nervous puppy. This is especially useful when you first take your puppy home to calm it without promoting an unhealthy attachment which will prove hard to rectify later in life. 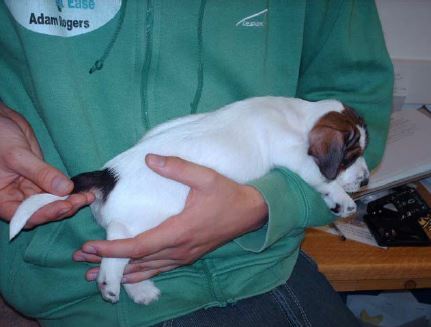 Notice how this puppy is being settled with another hand, the use of the second hand helps to give a feeling of containment. It is very important not to hold the puppy down at any time as it should always have the opportunity to move if it wishes. moistened with a little water first) This helps to calm anxious, emotional behaviour commonly seen in new puppies. The mouth TTouch also helps reduce the irritation caused during teething, reducing the puppy’s wish to chew every hard object you own! Photo 2: This puppy is lying down enjoying the Mouth TTouch; however she still finds it rather unusual. The Mouth TTouch is very light and not uncomfortable; dogs will often push you away to start with simply because it’s a strange sensation. The Mouth TTouch is all the more important for puppies to learn to accept having their mouths handled for tooth brushing and vet visits. The mouth work helps reduce inappropriate chewing. It is important to do short sessions of mouth work and know that much of the benefits will be seen later. As I said puppies have to learn about their bodies in a relatively short space of time, often they are still unsure where they start and where they end! By using the Tail TTouch we can give a puppy information as to where it is in space not only helping the puppy to balance but helping to prevent the usual clumsiness so common in adolescent dogs. Photo 3: The tail TTouch involves very gently moving each vertebra from the base to the tip. I can’t stress enough how gentle these movements are as the tail is very delicate. The tail may also be gently circled at the base. The aim isn’t to see how far the tail can be moved but to gently give the body information as to where its tail is and what it does! It is also said that certain endorphins, or ‘happy hormones’ are released when the tail is moved in this way, helping to calm a puppy. An overly anxious puppy with a continually wagging tail can be calmed by gently containing the tail, causing the wagging to stop, rather like a hysterical person made to sit to calm down. Stopping the movement of the tail often results in an instantly calm puppy. After some initial confusion, most puppies love the Tail TTouch, this puppy has become totally relaxed at the gentle movements. When the Tail work is being done, it is useful to feel for kinks and bumps as these can indicate levels of tension in other places. Have you ever noticed how you get ‘butterflies in your stomach’ when you feel worried? Puppies can suffer the same, holding a great deal of tension in their abdomen often resulting in vomiting especially in the car. 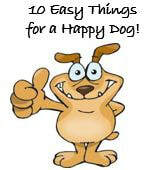 Ideally we would like a puppy’s experience of the car to be as positive as possible to prevent problems in later life. By using a small towel or your clasped hands to make slow, gentle lifting movements, you can work to reduce the tension through the abdomen. Photo 4 & 5: This puppy is having gentle Belly lifts with a piece of kitchen towel, the lifting movement is tiny, only 10mm (1/2 inch) of so. Notice how, in picture two, the puppy has relaxed his spine allowing his back to be much more flexible, also he is now standing more squarely with both hind feet being level, as apposed to having one foot behind him as in picture one. The TTouch offers a fun opportunity for the whole family to have a positive influence on the life of their new family member. Children take to the TTouch movements with ease and it can be a fantastic way to teach a young child to interact with a puppy, counteracting their instinctive need to grab and cuddle! Each TTouch movement is complete and every TTouch will make a difference. Above all remember that your puppy is often behaving instinctively and knows no other way. With guidance, a lot of patience and the power of TTouch we can work to make the puppy phase run as smoothly and be as much fun as possible, with a well adjusted adult dog at the end of it! 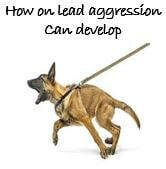 A great article which shows you the signs that your dog is not coping and how aggression could be the end result. Some great tips on how to cope with a dog like this and understand why this behaviour may develop.